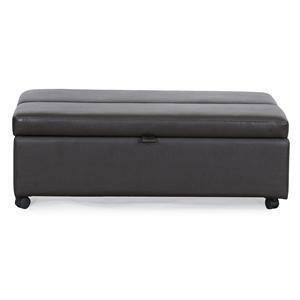 This is a great bonded leather cocktail ottoman that hides a sleeper unit inside. This is perfect for kids rooms for sleepovers or an extra bed for that out of town guest. Caster feet and an easy lift top make this unique piece completely functional and easy to use. The 1036 Casual Ottoman Sleeper with Casters and Lift Top by Synergy Home Furnishings is available in the area from BigFurnitureWebsite.